The Universe that Understands Itself? 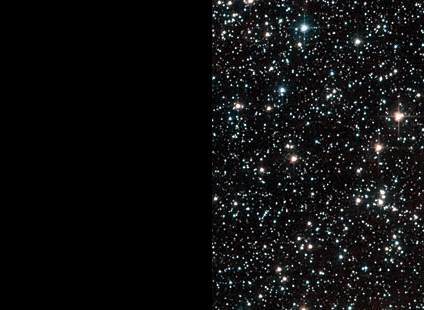 Once upon a time, about 200 million human lifetimes ago, a universe began. This was not just any universe. It was a universe with some very remarkable properties. Were there an infinite number of physical laws that could have been used to build a universe, or were the laws that could produce a viable universe rather restricted? How were the laws decided? The universe that began so long ago was one in which matter and energy were interchangeable, linked by the speed of light squared; in other words, a universe in which E = mc2. It would have been a very different universe had E = mc; the universe would then be a cold, dismal place. Had the laws of science not been exactly as they are, space would most likely look like the left side of this image, not the right. In this remarkable universe, the speed of light was so high that a tiny amount of matter could be converted into an enormous amount of energy, an amount given by E = mc2; it would have been a very different universe if the speed of light had been the cruising speed of a snail; again, cold and dismal describes the result. This was a universe in which tiny particles of matter were formed when an initial big-bang of expanding energy cooled; we call these particles atoms. In this universe, atoms had a property called mass, giving them a mutual attraction, which could pull them together with sufficient force to form stars, in which they would be squeezed into larger, more complicated atoms. Had this mutual attraction (we call it gravity) been half as strong as it is, the universe would not be what it is now. There would be no stars and – you guessed it – the universe would be a cold, dismal place. The universe is, however, not cold and dismal, because stars formed. Stars have two vital roles in the universe: they assemble matter into a variety of different building blocks – the chemical elements – and produce the energy that enables these chemical elements to do interesting things. Many stars have already died in supernova explosions, liberating the elements they have synthesized into cooler space. At more moderate temperatures than the interiors of stars, most elements don’t stand aloof from other elements. They combine with one another to produce compounds. Molecules based on carbon have a particular talent for complexity, and have acquired the ability to make copies of themselves. 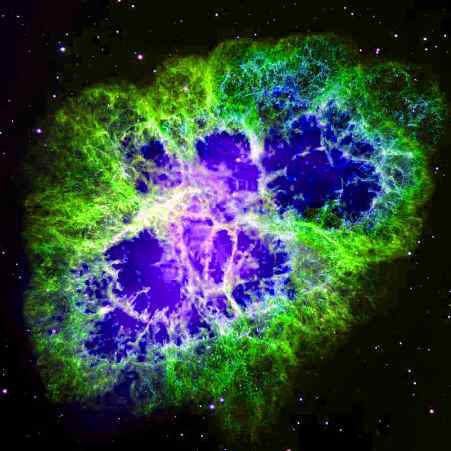 The Crab Nebula is what we can see today of a supernova in the year 1054 that ripped a star apart. Chemical elements the star had synthesized were sprayed into space, possibly to form new solar systems and even life. One of the highly interesting things the carbon-based molecules eventually did was to assemble themselves into Albert Einstein, who discovered that E = mc2. Albert Einstein tried to understand the laws that made our universe viable. He was a small part of this universe. You, dear reader, are another. This is a universe, therefore, whose components eventually assembled themselves in such a way that they would turn around, look at themselves, and try to understand how they and their universe had been created; a universe whose building blocks would become intelligent. Our universe is a remarkable phenomenon. 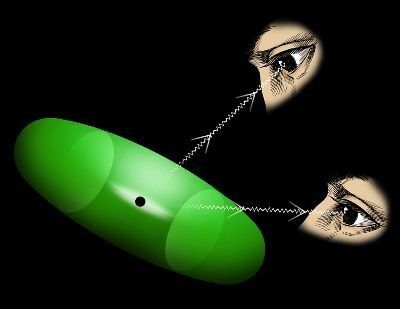 Is there a reason an atom or a cosmos would want to look at itself? To really get at this, one has to think about mathematics. Nova did a great episode on this, rebroadcast last night: “The Great Math Mystery” (http://www.pbs.org/wgbh/nova/physics/great-math-mystery.html). There’s a transcript. Bill Nye, “the science guy,” has gotten some attention for the notion of we being one way the universe comes to know itself. But the notion is actually simplistic for the sake of useful effect: that we are truly coming to know the universe, though we are entirely explained by that evolution within the universe. It’s not about the cosmos knowing itself (let alone “an atom’s way”) because the emergence of intelligence is what is knowing (or coming to know). Intelligence in the universe is coming to know. The universe itself has no intelligence. It has mathematizable form (relative to approximative methods: “exactly” Newtonian, but very statistically quantum-determinable, but incalculably so), and the evolved intelligence that we sometimes are (the more-mathematical among us) is doing very well to evolve comprehensibility of that. But we’ve evolved string theory (10+ dimensions), which is untestable. So, where are we? We created the gods who need us, in order to “exist,” and we continue to evolve. We try to take philosophy of mathematics beyond the Gödelian condition of ultimately non-self-programming computability. I could go crazy thinking about the universe, whether it understands itself or not. I can’t get my head around a universe that has been here forever. I can’t get my head around a universe that randomly generated itself from nothing. I can’t get myself around a god that has been around forever and one day decided to create the universe. So what’s left? it’s tough. might be there are things our brains aren’t equipped to understand. why should they be? i know i can’t get my head around the concept of infinite time or infinite space.